Mrs. Ziva Pash is a Chabad emissary in Ein Hanetziv in Northern Israel, where she was interviewed by JEM’s My Encounter with the Rebbe project in August of 2014. I was born in Tel Aviv in 1945. 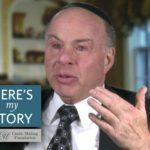 My mother was a religious woman, the daughter of a Jerusalem rabbi, but my father didn’t want to have anything to do with Judaism. That all changed, thanks to the Rebbe, as I will explain. Because of my mother’s insistence, I received a religious education. When it came time to enter the army, there was a surplus of female soldiers so I signed up for “national service” and was sent to Ein HaNatziv, a moderately religious kibbutz, and I ended up staying there even after my service ended. That is where I met my husband, got married and started a family. All the while, we tried to be ultra-religious. As a result my children faced a lot of scorn and ridicule from their peers. When it became unbearable for us to continue, we decided that it was time to leave. 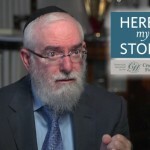 Previously, I had met two ladies who were emissaries of Chabad – Rochel Dunin and Rivka Sassonkin and through them I developed a close connection with Chabad. And I decided that I would first travel to New York to receive the Rebbe’s blessing before the big move. This was in 1976, a month after Rosh Hashanah. Having stood in line for as long as he did, my father got flustered and didn’t know how to answer. Somehow my married name – Pash – just escaped his mind. After several excruciating moments the Rebbe finally said, “Do you mean Ziva Pash?” Apparently, the Rebbe remembered my name from the nine letters I wrote him in the past. Then he handed my father a bottle of vodka – in order so say l’chaim – and he blessed him to have nice grandchildren. My father was so inspired by this interaction that, on the spot, he resolved to begin increasing his religious observance. The Rebbe then asked me if I had received dollars which he had distributed following the farbrengens, I replied that I had, but my bag was stolen – there had been a total of fourteen dollars in there. So the Rebbe took out fourteen dollar bills and handed them to me. He also asked that I put up a charity box at the kibbutz and he said, “I want to be the first to contribute.” He gave me three hundred Israeli lira to place in the charity box. Before I left Israel for New York, I had told the kids that we would be moving away from the kibbutz. They were all ready to pack and go. But, when I returned, I had to explain to them what the Rebbe advised, and why we needed to follow his advice – that our job was to be a living example for our neighbors and friends. Not one of them questioned or complained; we just went on – for, by this time, we had such a strong connection with the Rebbe. And what do you know? The Rebbe did understand, and he replied, “I just received the nice drawing you sent me.” He followed that with many blessings for her. My daughter was the only one of two dozen girls going to school in a skirt instead of pants. Many times, the other children ridiculed her, and she came home crying. And that’s when I would wash her face and give her a cold drink, and then show her the Rebbe’s letter to her. That would calm her. She remembered that we had a mission to fulfill, and that gave her strength. It was difficult to live on the kibbutz in other ways, particularly when it came to money. For example, every year I wanted to attend the Chabad Women’s Conference in Netanya, but I didn’t have the money to go. Even when I was invited to speak, I was embarrassed to tell them that I couldn’t come because I didn’t have the money for the bus fare. 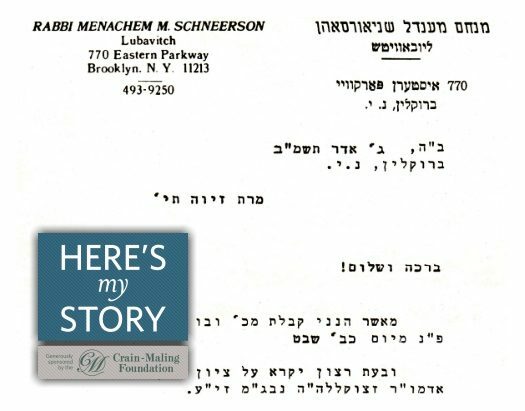 One year, I sent a letter to the Rebbe, telling him that I would not be able to go to the conference because I didn’t have the money. This was in 1986. 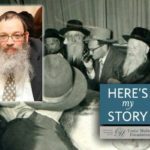 Shortly thereafter, I received a phone call from Rebbe’s secretary, Rabbi Binyomin Klein: “The Rebbe sent money for you with someone coming to Israel.” By then the registration was over and I had to explain to the committee that they needed to let me in because the Rebbe wanted me to participate in conference. Since then I have never missed a conference, because I know the Rebbe wouldn’t want me to. I always felt that he knew what was best for me – as a father would. My husband called him “our spiritual father,” and he was that and so much more to our family. Why has JEM not printed the entire letter but rather cut off the bottom? Interesting, are they hiding something in the Rebbe’s letter that they cut off half? Letter from rebbe with no signature.